Developed back in the 1970s, with ideas that it might become a replacement for paper, this paper makes magnetic fields visible. Any magnet can be used, and the paper will make the magnetic field visible.It consists of a thin plastic sheet containing tiny cells containing liquid. Each little cell contains colloidal iron. Hold a magnet near, and the iron in each of the cells will align, and form a pattern on the paper.We also supply a small piece of magnetic plastic which has alternating lines of North and South poles. 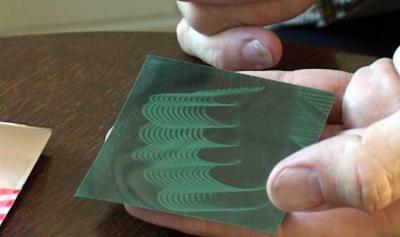 Move this across the Magnetic Field Paper, and these lines are made visible.The paper comes in squares of 3 x 3 inches. You can cut the paper with a pair of scissors if you wish. What's to say? It shows magnetic lines of force. Very interesting, fun and useful. I suggest getting this large version over the smaller one. Very nice gadget, although I would have appreciated a bit better description on the shape of the included magnet, and on the different effects different magnets can have. Does what it says on the tin, neat toy.